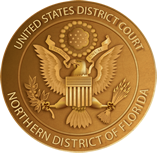 Under the CJA eVoucher Program you will be filing CJA vouchers and related documents electronically with the U.S. District Court for the Northern District of Florida. When using the CJA eVoucher Program you must abide by the Federal Rules of Civil and Criminal Procedure, CJA Guidelines, the Local Rules, and any administrative orders and policies of the Northern District of Florida. You have full responsibility to ensure your user information, including your billing information, is accurate. The combination of the username and password within the CJA eVoucher Program will serve as the signature of the attorney filing the voucher or documents under the afore referenced rules and procedures. Therefore, you are responsible for protecting and securing this password against unauthorized use. If you have any reason to suspect that your password has been compromised, you are responsible for immediately notifying the Clerk of Court of the suspected breach of security. Questions? Please call Erica Smith at (850) 470-8127 or use our online contact form, regarding any questions you may have about your appointment.